Note: This is not a paid advertorial. I was not compensated in any way for this review. All thoughts are 100% my own. 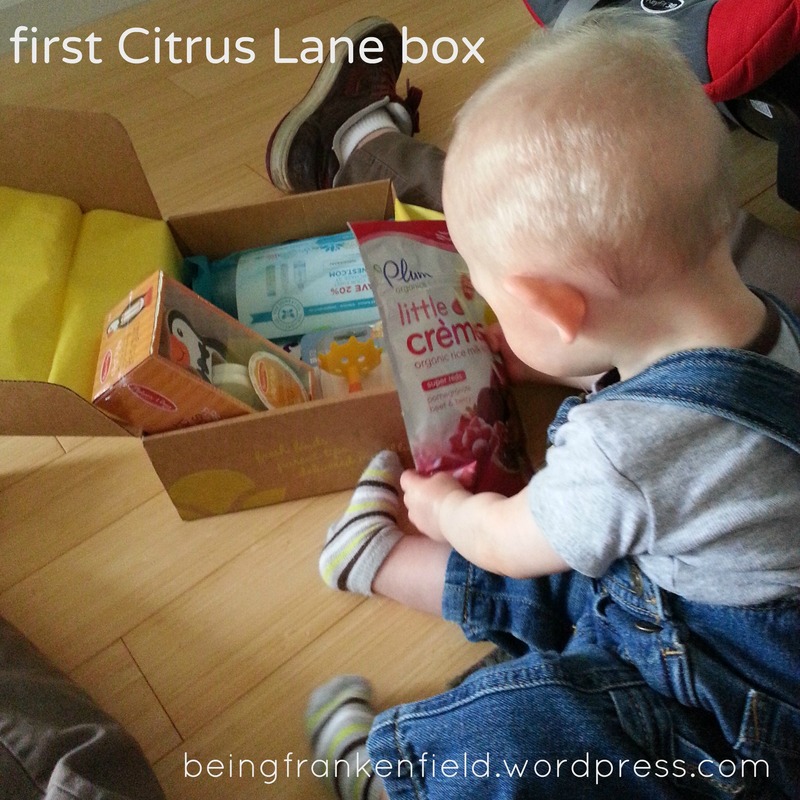 I ordered my first Citrus Lane box in April 2013, when Ian was just 6 months old. I didn’t know anyone who subscribed to Citrus Lane, but I had seen an ad on Facebook, and I have to admit I was intrigued. Subscription boxes were a fairly new concept to me at the time (I guess I was living under a rock), so I wasn’t really sure what to expect. I checked out the Citrus Lane website, read up on their various brand partners, read reviews…anything to try to make my decision about whether it would really be worth it to sign up. In the end, I just decided to take the plunge. I knew I’d always be wondering otherwise. And I was reassured with the fact that I could always cancel if I wasn’t impressed. I was hooked after my first box. Yes. It really is THAT good. “But WHY?” you may ask. Well, let me tell you why we love Citrus Lane, and why I recommend it to friends and family with kids under 5. There hasn’t been a box yet that I’ve disliked. And having received over 12 boxes, that’s quite a feat. I love that the items are age appropriate, and I’ve definitely noticed them growing with Ian. But probably what I like the most is the mix of items that come in the box. 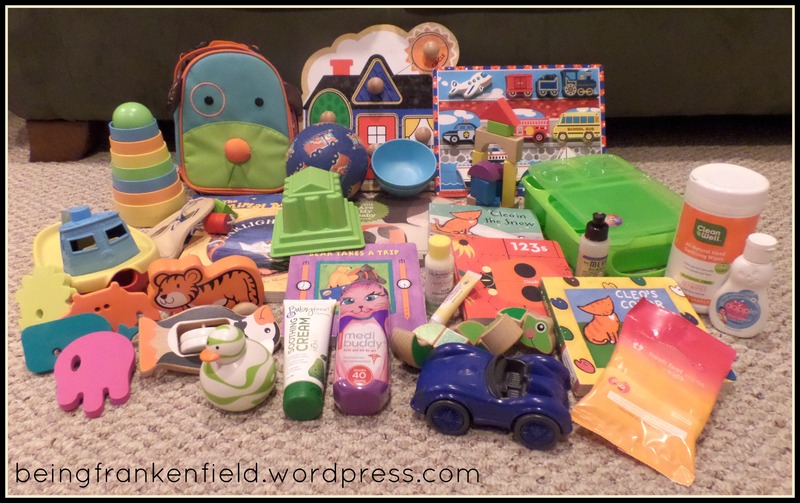 I can almost always assume Ian will get at least 1-3 toys of some description. The next pretty sure item is a book (which I love!). Followed by a “beauty” product (lotion, shampoo, body wash, sunscreen, etc). Most of the time, we also get some type of food (a package of teething biscuits, a pouch of yogurt drops, a bag of organic cookies, etc). And last, but not least, Citrus Lane always seems to throw in an item for mom (Julep nail polish, juice Beauty hand cream). I don’t know how they always come up with such a great combination of products, but they do, and it’s pretty genius. The fact that most of Ian’s “stuff” came from a Citrus Lane box speaks volumes, and that’s one of the main reasons I continue to subscribe. I tried to round up a good cross section of the stuff we’ve received over the past year to help illustrate this point. In one word, Citrus Lane is awesome. This is pretty self explanatory- who doesn’t love getting mail? And if you like surprises, that makes this whole deal even better. I will admit that at first, this excitement factor was really more for me than for Ian (I mean, does a 6 month old understand or recognize that he is receiving mail?). Now that Ian has gotten older, however, he’s started to grasp the concept that this big brown box is his to open. Once we start opening it, he gets pretty excited and loves to explore what’s inside. It’s so fun to watch! At $21 a month, this is a pretty good deal. I have no idea if it’s the cheapest kid subscription box out there (I love it so much I haven’t bothered to look elsewhere), but I’m not sure how you’d get so much quality for any less. In fact, I’m not sure how they manage to squeeze in the items you DO get for such a good price. To top it off, the shipping has been fantastic- my box has always come when I expected it to (one or two boxes were maybe a day later than I thought, but considering it had to traverse the country and gets placed in my mailbox, I’m not complaining!). I have been really impressed with the customer service and general friendliness I’ve experienced with Citrus Lane. I get a survey for each box where I can provide feedback and rate the products I received. Most of my survey responses include a comment along the lines of “keep up the good work” because I really have been so pleased with my subscription. If you’re on the fence, and have ever even considered subscribing to Citrus Lane… do it! I haven’t regretted it for one minute! Pingback: Books! Gads of Books! | .being frankenfeld.